Wow! What an explosive, action-packed thrill ride! This book in the Blake Meyer series is set mostly in Florida with occasional scenes from Russia and other locations. The timeframe is modern day, and the plot all too real, one that could have been ripped from newspaper headlines. Blake Meyer is contemplating retirement from the FBI. He has only three months left on active duty in the field and then he wants a desk job. If that isn’t in his future, then he can try his hand at consulting work. Now that he is married with two children, he must look to their future as well. So when he is put in charge of the investigation into the execution style murder of a former IRA member, Blake wants nothing to do with it. As more information comes to light, Blake begins to realize he is the one person most qualified to lead this task force. Soon Blake is having private conversations with the President of the United States about where this investigation is going and also about a mole in the President’s organization. With few people to trust, the President and Blake agree to a plan only a few select people are privy to. Blake, with the help of his friend Harrison, continues to interrogate a captured Russian agent, track emails and photographs, as well as deal with his ever cautious boss. Blake unravels information that shows a huge terrorist plot that is to be launched on United States soil during Ramadan. He has his work cut out for him with such a tight timeline. Who is behind this ingenious, yet nefarious plan? Who can Blake really trust? Can he really stop this plot of bioterrorism before the contagion is released? This is the first book in the Blake Meyer’s series and it is one reader’s won’t be able to put down. This is a spy lover’s must read. 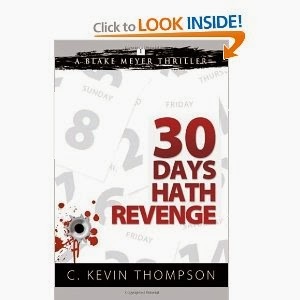 The book does end with a cliffhanger, so not all loose ends are resolved in a nice neat package. The only negative about the whole book is that it had to end! The next exciting installment in the series is due out in 2014 and is titled, Triple Time. I highly recommend this pulse-pounding story! Guest review of "A Melody for James"